It's Friday! 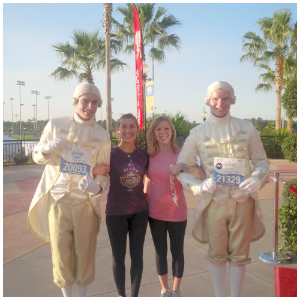 Congrats to all our friends who got up this morning to run the Disneyland 5K! We however, are beach bound! 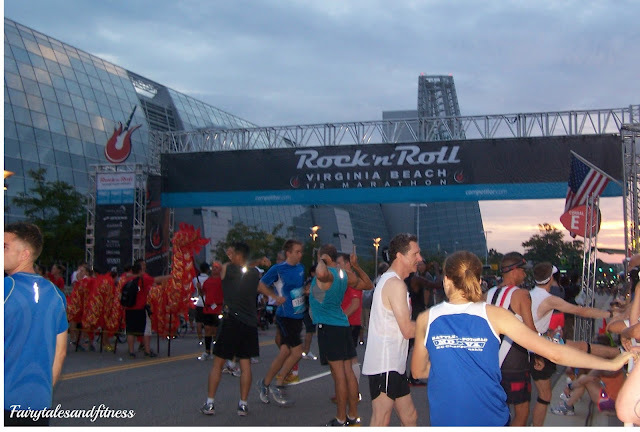 As most of you know, My mom, sister, and I will all be running the Rock n Roll VA Beach Half Marathon this weekend. 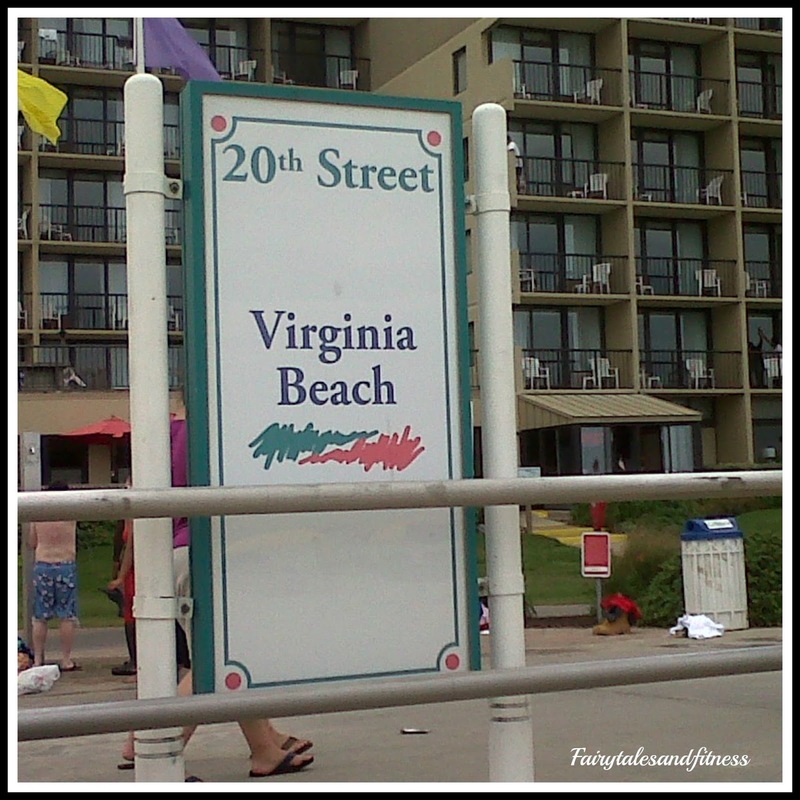 We will be headed down to the beach later today, possibly going to the race expo at the VA Beach Convention Center, and hopefully visiting a Sweet Frog. We will be staying social all weekend. If you would like to stay connected with us make sure you join our Facebook page at www.facebook.com/fairytalesandfitness, ( if you haven't already, I hope you join. We'll be sharing lots of fun pics) and although we've been so relaxed in using it, we will promise to use twitter this weekend too! You can follow along with us @fairytalesnfit. We will probably be riding our bikes to the expo when we go, so I hope to not have to report another Friday folly. Please keep your fingers crossed! Just in case you've missed last year's Rock N Roll Race recap, we'll leave our link here. 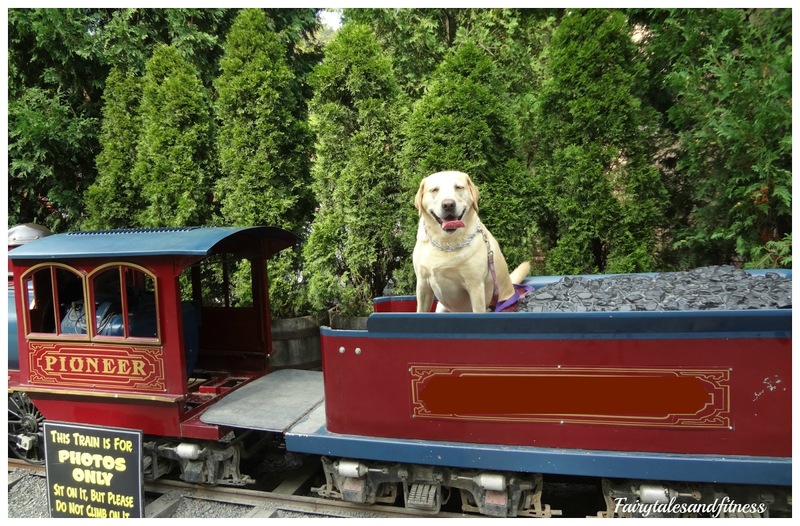 What fun things do you have planned for this weekend? Please share! 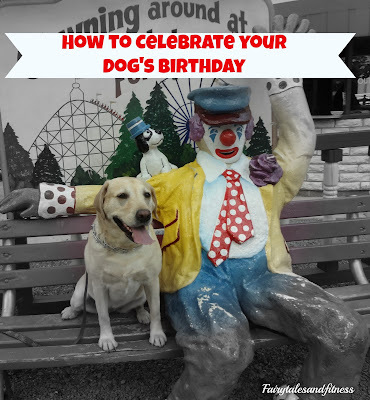 Our Yellow Labrador Belle had a birthday this week. She is now 6! Our family is crazy about our dogs, so of course we had to let her celebrate! We're on the train and this thing actually goes faster than we thought! She must be looking for bunnies! Yum, I am a happy dog! After this afternoon, she was one Dog-gone tired dog! 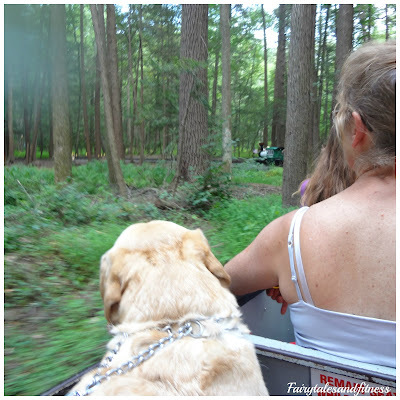 Thanks for reading our fun little post! 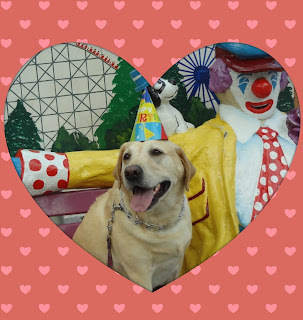 But shhh, please don't tell Baylee we went to the amusement park! One of my favorite cities in the US ( besides Orlando of course), is Dallas Texas! I lived in Texas when I was younger and have been able to go back and visit several times since I’ve been married. President Kennedy was shot from the 6th floor window of this building. 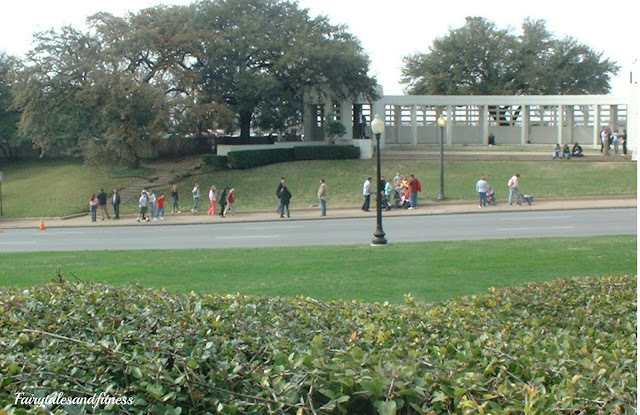 This was the street where president Kennedy was shot while riding with his motorcade. 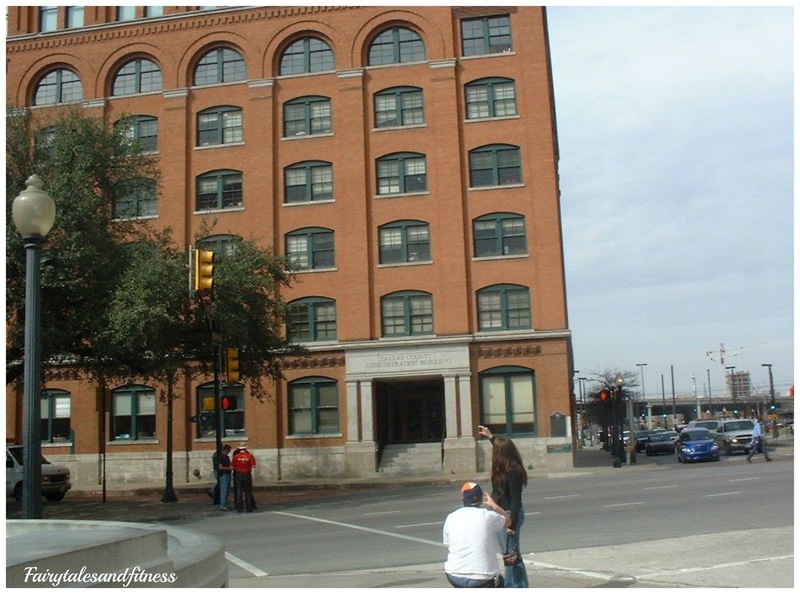 While we were in the gift shop of the book depository, I was looking at brochures of other attractions to visit in Dallas. I came across a brochure for ‘South Fork Ranch” Does that name ring a bell for anyone? 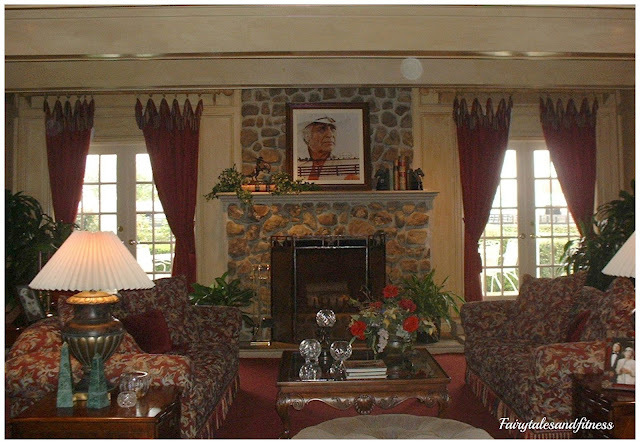 Southfork is the home of Dallas, the TV show. I of course was not old enough to watch the program at the time it originally aired, but I vaguely remember my mother watching it and I remembered the opening scenes. I was intrigued. 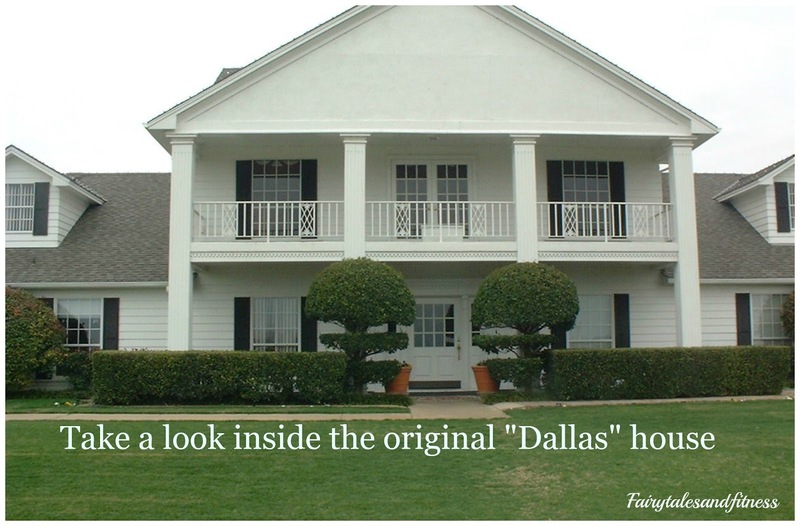 I wanted to visit Southfork and see how this piece of TV history was made. The property of Southfork is just as beautiful in real life as it is in person. 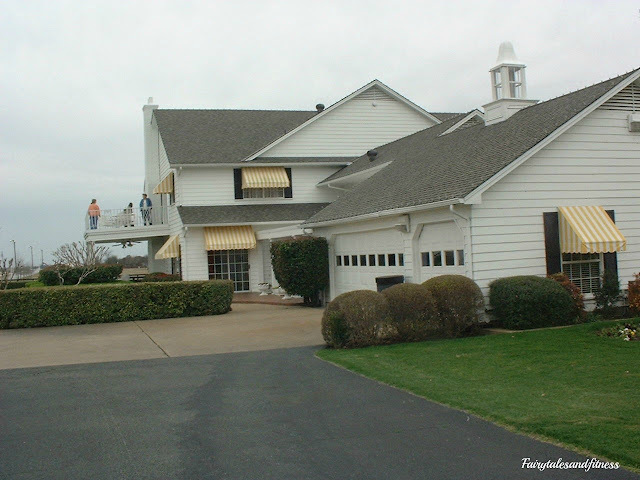 We toured the studio museum, the barns, and of course the iconic Ewing residence. I was surprised to find out that for several years while they filmed at this residence, a family still lived in the home. The production company paid the family just so they could use the outside of their home. All the inside scenes where actually shot in a studio in California! As we toured the house, the guide was telling us bits and pieces of the legacy that would be the Ewings. I of course had no idea what he has talking about because I had never seen the show. I knew who the main characters were, but didn’t know what their relationship to each other was. It’s a good thing that I had seen the show before this tour because I probably would have been disappointed. 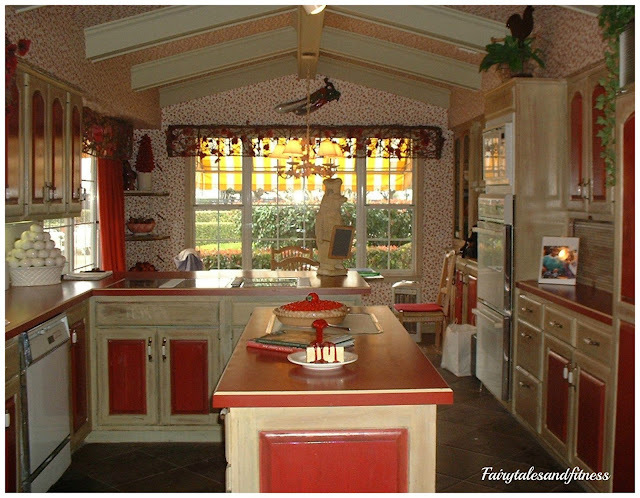 Afterall, the inside of the house we toured looked nothing like the inside of the house on TV. If I would have seen the show before the tour, I would have thought things like, “That’s not what JR’s room looked like, “That’s not the same kitchen”. I’m that person that pays attention to detail! 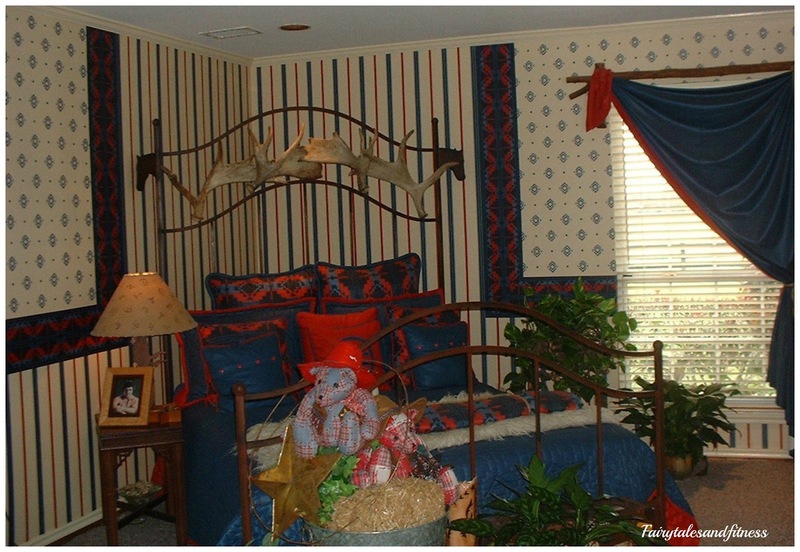 Here are just a few of the rooms. 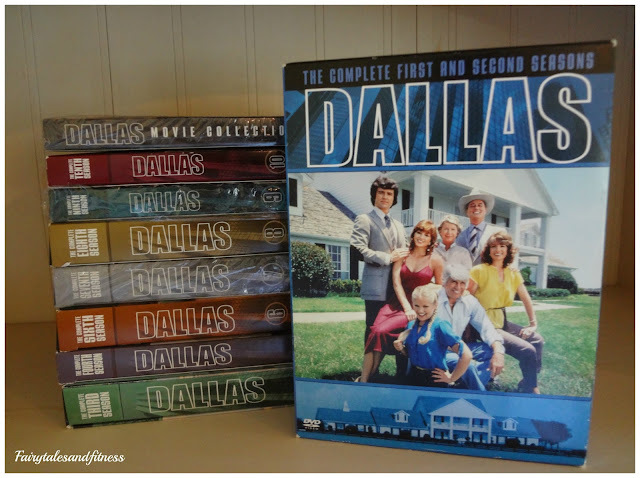 So after our visit to Southfork I had this bright idea that just maybe I would be able to find this series on DVD. Afterall, they were bringing a lot of the old shows back on DVD. What were the chances that I would find Dallas? Well, I hit the jackpot. I found that season’s 1,2 and 3 were out already. After that, I had to wait several months ( sometimes years) for the following seasons to be released! I can now say I am the proud owner of Dallas Seasons 1-13. I have watched all 13 years of the Ewing’s life. Wow, what a journey it has been! So now, of course I am a fan of the “New” Dallas. I often wonder if the writers of this new series have actually sat down and watched all 13 years of the original Dallas. There are certain things and pieces of information that I feel have been forgotten from years gone by. Maybe things will be cleared up in the next season of Dallas on TNT. I am just sad that I have to wait till January 2014 to find out! Have you ever become hooked on an older TV series that you've discovered much later? 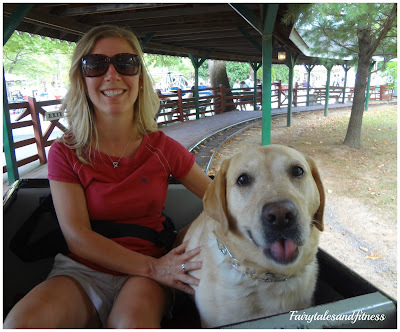 Be Nice To Your Flight Attendant ( It Could Be ME)! 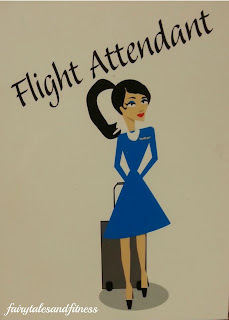 Many of you may be traveling this week for a race- cation so I thought this was a perfect time to give you all a little reminder about being nice to your friendly flight attendant ( because it might be me)! 1. Do not state the obvious. We know when the plane is too hot or too cold. That's why you should always bring a sweater when the air is too cold. 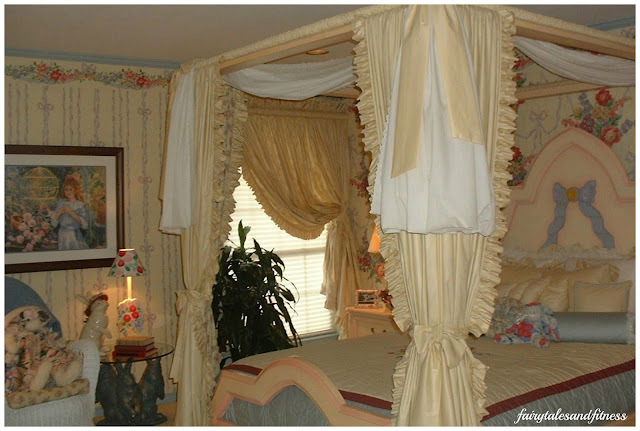 Also lowering the window shades help when it's hot. The plane has a greenhouse effect. When the sun is beating in through the window of course it’s going to be hot. 2. We have no control of the weather! It is not our fault that we get delayed or have a maintenance issue. 3. We are on the plane with you so therefore we have no information about your connecting flights. We do not have an imaginary computer to look to see if flights are on time or delayed. Do not ask if the captain can call ahead to say you are coming. 4. When boarding do not ask if it is a full flight or if the boarding process has been completed when we walk down the aisle just so you can move to an empty row. You will know when the boarding process is complete when there are no more passengers boarding the flight. 5. After boarding, stow your luggage as quickly as possible and sit down. You don't want to be the one holding up the boarding process because you need to get things out of your bag. 6. Respect the seatbelt sign. We know that it may stay on for longer than what it should, but there is usually a reason, so please ask before you just decide to get up. Do not get up during the beverage service! 7. When asked if you like a beverage, say what you would like,” not what do you have?” It's easier to say that we don't have it then saying every option we do have. 8. During the beverage service let the flight attendant know if you do not want ice before they start to pour your drink. If you don't say anything we usually put ice in it automatically. Don't be afraid to ask for the whole can. It usually is not a problem. 7. Follow the portable electronic devices rule. Now we all know that a plane is not going to go down because a cell phone is on, but it is still the rule, so be respectful and follow it. So when you hear the announcement to turn them off...do it! 8. Flight attendants are there for your comfort but more importantly for your safety. Please know there are many circumstances that are out of their control, so don't take it out on them. As long as you show respect you will receive respect. So remember, the next time you step on the plane for your next race –cation or vacation, always be nice to your flight attendant, it could be me! Have a safe flight everyone! 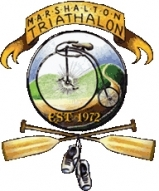 I know in a previous post we said we didn't want to think about fall yet, but we have been notified of these really cool races for this fall! These themed races look really fun. I don't know if we will be able to do any of them because our fall schedule is filling up rather quickly, but maybe you will find one near you that you'll be able to fit in to your fall schedule. For more information or to register for each of these races click on the (Source) link below the image. 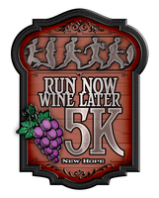 Races for the wine enthusiast! Do any of these races interest? I think the ones that run through the vineyards look like fun. I have participated in one of the Atlantic City Marathon weekend races before and that was fun. 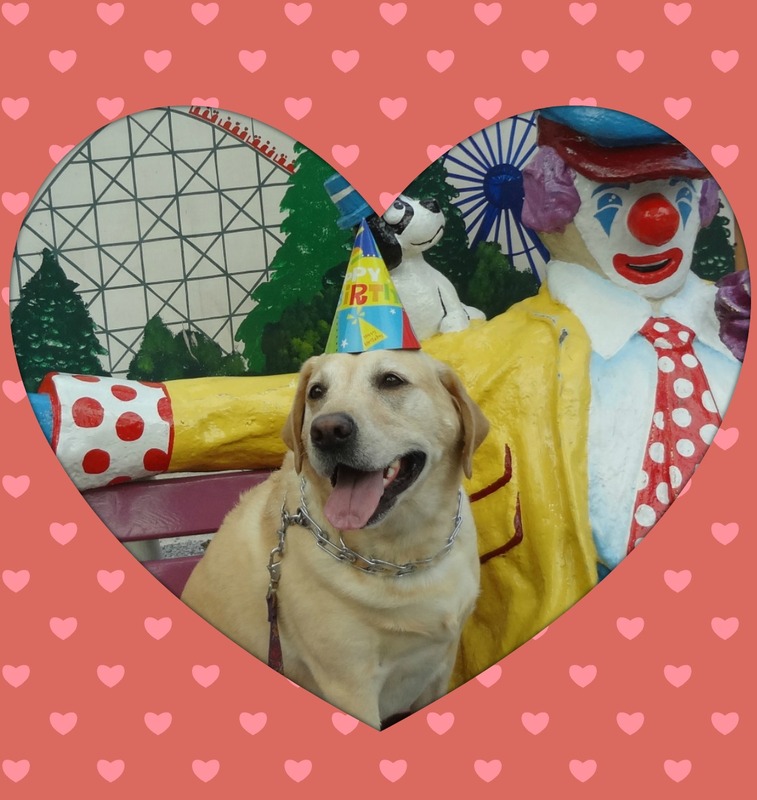 I loved running on the boardwalk! School may be back in session in some areas but it’s still summer in our little part of the world! 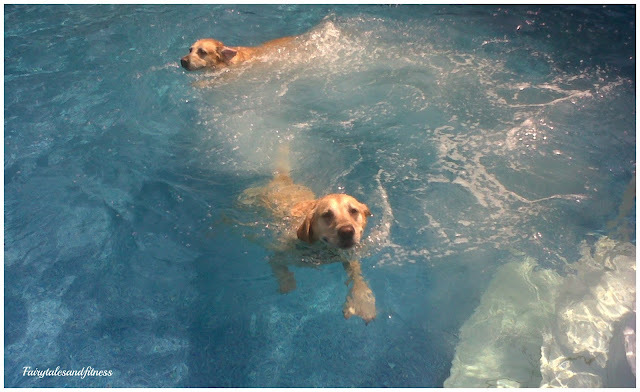 After doing some yard work yesterday, we spent most of the day swimming and hope to do more of it today! 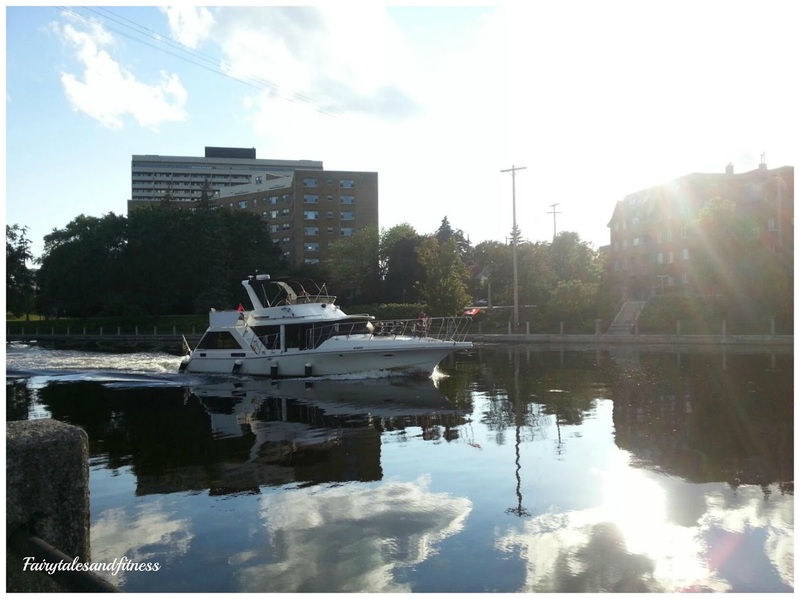 I say it is still summer for us because we still have much to look forward to. 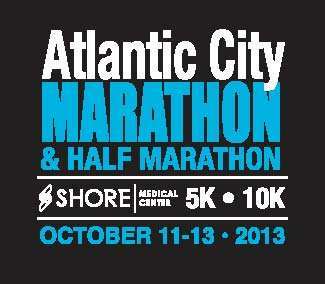 Next week at this time we will be at the beach preparing for the Rock n Roll Half Marathon. 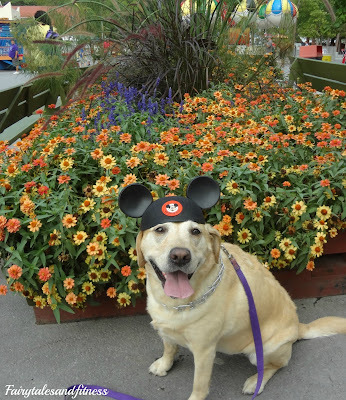 At the same time, some of our friends will be participating in the Dumbo Double Dare at Disneyland in California. If that is you, best of luck to you! Yet others will be participating in various races over labor day weekend. Where ever you will be racing, we all have one thing in common. This is our last weekend to get our training in. I don't know about you, but I'm kind of nervous! I know I'll be doing a long run today, leg strengthening exercises on Saturday, and another long run on Sunday. If you have a race over labor day weekend, how are you training these next couple of days? If you don't have a race, how are you spending the rest of the summer? I was looking for something that would help get some kinks out and loosen my muscles for after my runs. Now I am a big fan of the foam roller, but that is not very portable nor suitable for traveling. When I was at this year’s Walt Disney World Marathon Expo, I discovered "The Stick." The Stick is like small plastic rings that rotate when you roll it on your body. They come in a variety of sizes, but I got the medium one because it is large enough to reach all places yet small enough to fit in a carry- on bag if you are traveling. According to The Stick, Here are a few of the benefits of using it. -The Stick rolls knots out of muscle, providing myofascial release and trigger point therapy. You can go as deep into the muscles as you are comfortable. The harder you roll, the deeper into the muscles you will feel it. It does come with a guide that shows what moves to get to certain pressure points. You'd be surprised how much you can do with The Stick opposed to just foam rolling the common arm and leg areas. If you really want to see how much the stick can do, go to an expo and they will show you all the moves that can be performed with it. It basically sells itself. I was sold the first time I used the product! Those of you who are going the Disneyland Half Marathon real soon might want to make a plan to stop by this booth and try out The Stick! If you are hesitant about buying The Stick, a fellow runner has informed me that you can use a rolling pin! That’s right a regular old rolling pin that can be found in the kitchen. Check it out and see how it works! Have you ever used The Stick? If so what did you think of it? Another Where in the World Wednesday post! 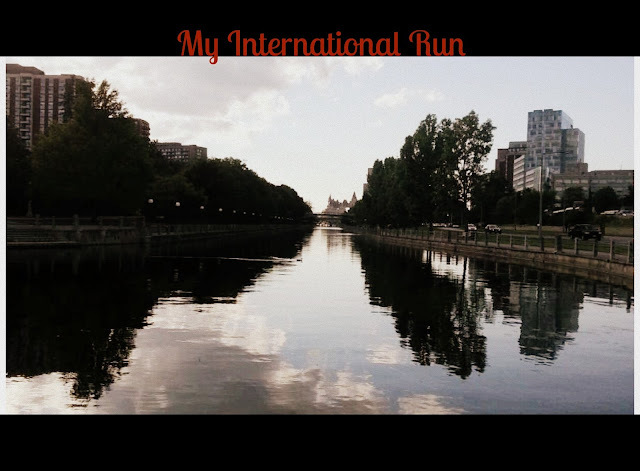 I arrived in Ottawa the other evening after a very long work day, but I still wanted to go for a short run. Overnighting in Ottawa, I am fortunate to stay right in the downtown area, which is very close to the canal, a perfect place to run and bike. Ottawa is a very fit city. 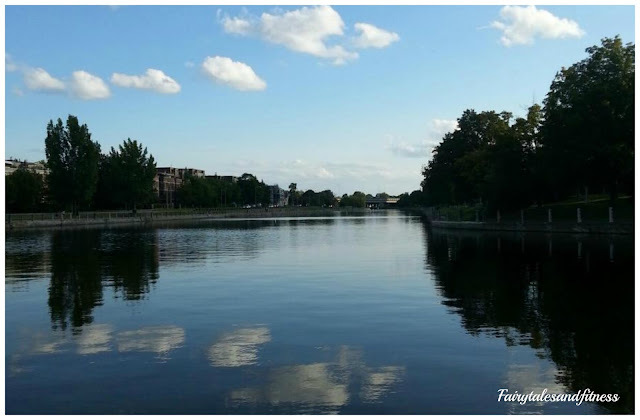 You will always see someone along the canal working out, whether it's in the 70s or in the 40s. Those Canadians are used to the cold weather! 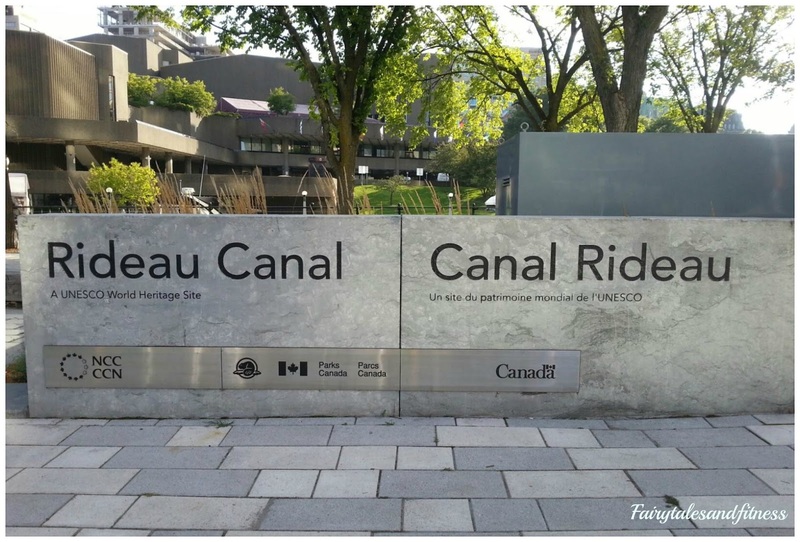 In the winter the canal freezes over and you can even ice skate on it. Well it was the perfect day for a run while I was there, In the low 70s. I started out knowing that I only wanted to do a short run since it's been a long day and the next day will be just as long. I don't know if it's a mental thing or not, but I had my GPS watch on, and I don't feel I work out as hard when it takes forever to find the location. I don't know if it was because I was in Canada that it made my GPS watch enabled or what the problem was but it would not find the location, so I had to just go by my watch time. I made sure I did 30 minutes, which for me would have been a little over three miles. 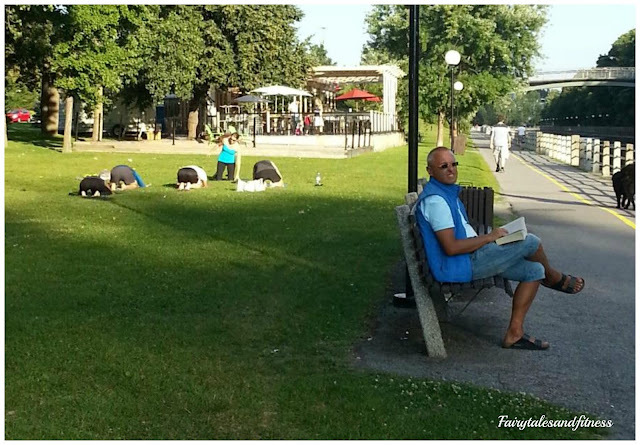 During my run I passed other runners and bikers along with people walking their dogs or just relaxing reading a book and even a yoga class. Here are a few more pics I took along my run. 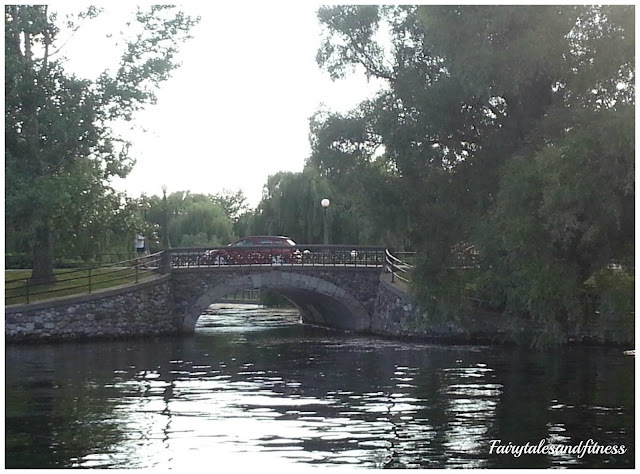 Because of the lovely scenery around the canal, Ottawa is one of my favorite places to run! Is there a certain place that you’ve had trouble getting a GPS location? 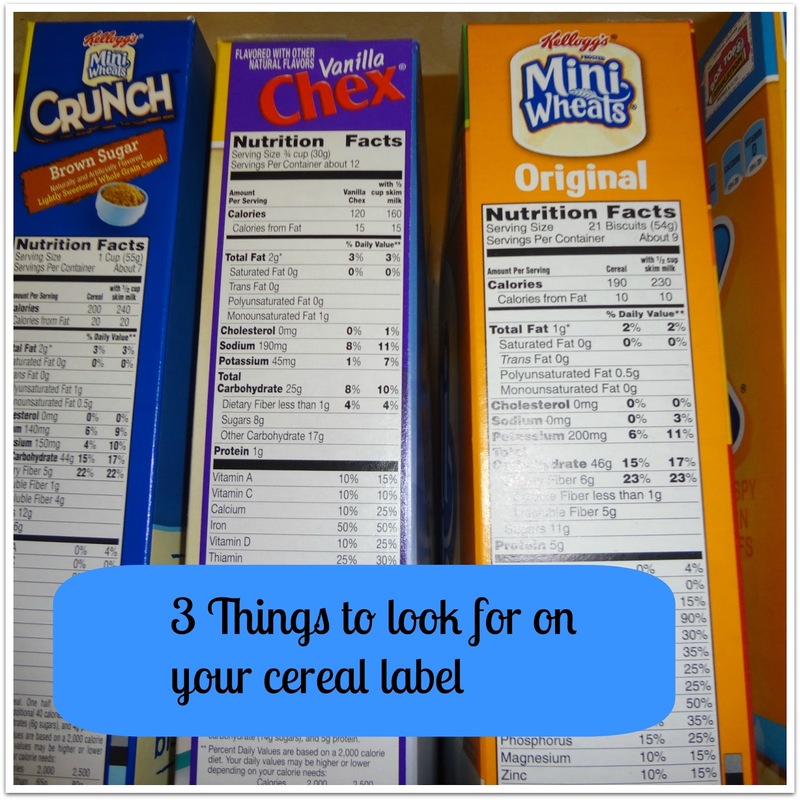 Take Another Look At Your Cereal Label....Is it as healthy as it could be? 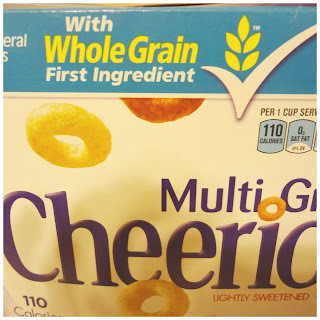 Since I talked about a healthy cereal this weekend, I thought I would continue the discussion on what you should actually look for in a “healthy” cereal. Now I warn you, this post clearly shows the Nutrition Teacher in me! In fact, I actually taught a lesson on this exact topic. A good whole grain cereal should supply at least 3 grams of fiber per serving. If it has less than 3 grams it may be higher in sugar or other unnecessary ingredients. A good whole grain cereal should have no more than 8 grams of sugar (unless it contains fruit). Those cereals containing dried fruit (raisins, strawberries, etc) can have 15-25 grams of sugar because you have to account for the natural sugar in the fruit. A good whole grain cereal should have no more than 3 grams of total fat. Of course there is an exception to this rule too. If your cereal contains nuts, 5 or 6 grams of fat per serving is reasonable. I will admit that although all my cereals are whole grains, not all of them follow these guidelines. 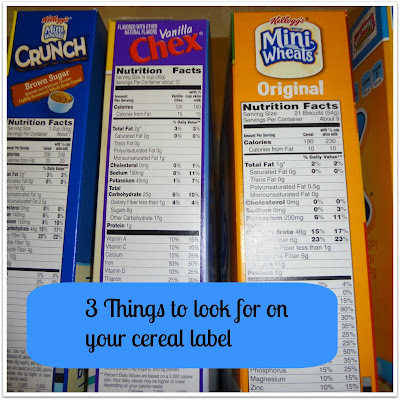 Okay, so go to your pantry and check the label of your cereal box. 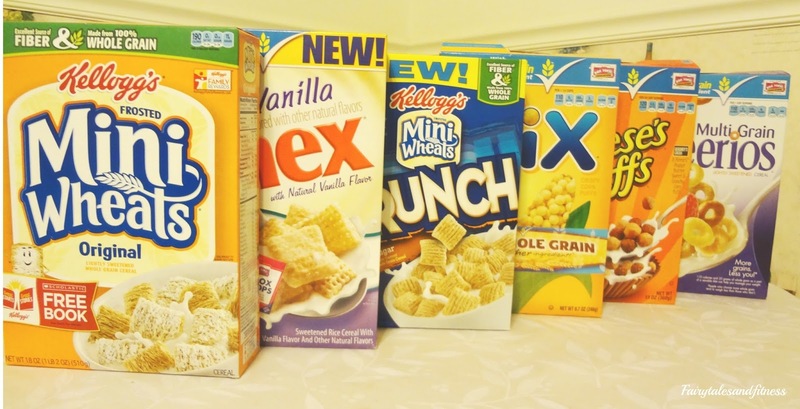 Does your cereal fit into these healthy guidelines? Disclaimer: We want to preface this post by saying that this is just for fun. You may or may not agree with the opinions we have posted and we are not saying any of them or right or wrong. My sister and I were in discussion the other day about Race Shirts and what we’ve heard other people say about wearing them to races. In any organized race (many of them anyway or at least all the ones that we’ve participated in) you get a race shirt. Sometimes is a cotton t-shirt, sometimes it’s long sleeved, and when we’re lucky, it’s a tech performance shirt! Everybody has their opinion on whether or not this “race shirt” should be worn the day of the race and in some of the online running groups we frequent people have even asked what the protocol is on that. 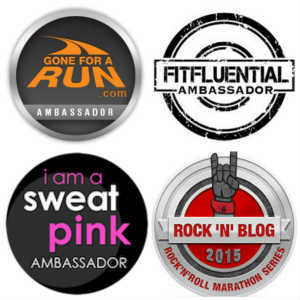 Here are some opinions that we’ve heard online and from other runners we know in person. You can tell who the newbie runners are because they are the ones that are wearing that day’s race shirt. Don’t wear the shirt until you’ve completed the race. 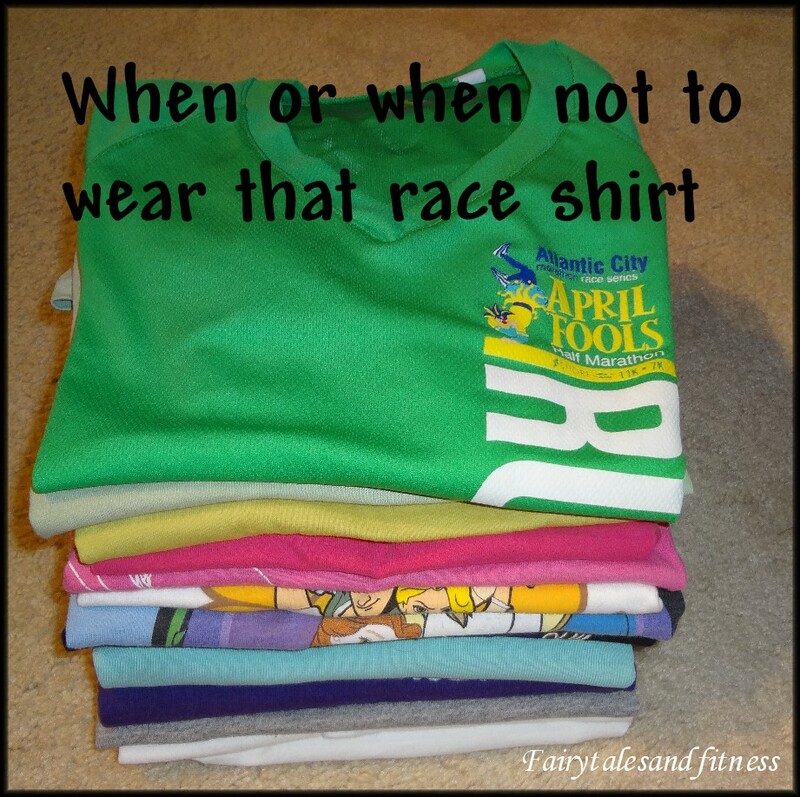 With that being said, there are also plenty of people who think it is okay to wear the t-shirt on race day. Personally, we feel people should wear whatever they feel comfortable in. With that being said, Yes, we are those people that have worn the given race shirt on race day! And it wasn’t just when we were “new” runners. We agree that if the shirt actually says “finisher” on it, then maybe you should wait till you finish the race to wear it, but keep in mind that if you are picking up your race shirt at packet pick up, you have been given the shirt for “registering” not “finishing”. The medals are for finishing. Most races are themed, and are for some type of charity or organization. When we wear our given race shirt on race day, we feel that we are doing it in support of the race, the charity, the organization, and the sponsors on the back of the shirt. Plus it’s nice to look “uniform” with each other and what a great picture op, wearing the race shirt during that particular race. If we are given a cotton t-shirt for our race shirt, then we will probably not wear it since it is not moisture wicking. 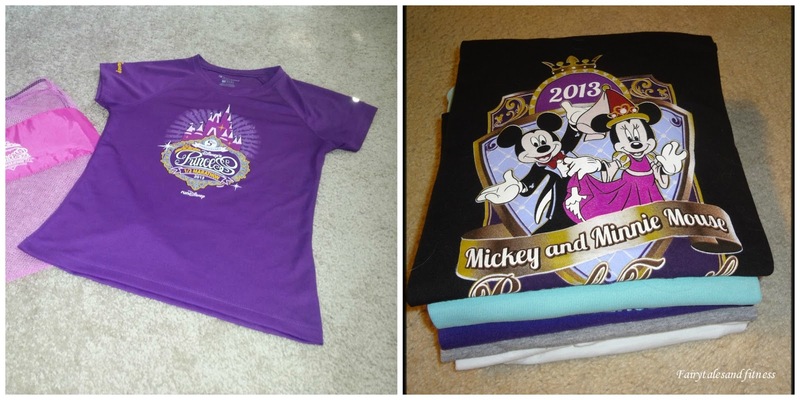 However, we have always worn the cotton t-shirts that we were given for the Disney 5K races. Our reasoning is that 1)it is only a 5K and at Disney it’s not like we are speeding for time 2) as adults, where else are we going to wear a t-shirt with Disney characters on it? If we are given a tech shirt then yea, we may wear it to that race. But of course there are always exceptions. Sometimes it’s just more comfortable to run in a tank. 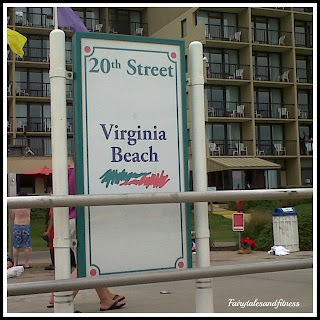 I doubt you will be seeing us at Rock N Roll VA Beach next month in our tech shirts ( because it will be so hot) and we probably won’t be wearing the race shirts at Disney either for the Glass Slipper Challenge next year. But the wonderful thing about not wearing the shirt on race day is that you can wear it later on in the day ( to the parks, the beach, around town, etc) and proudly show off your accomplishment! So there you have it. 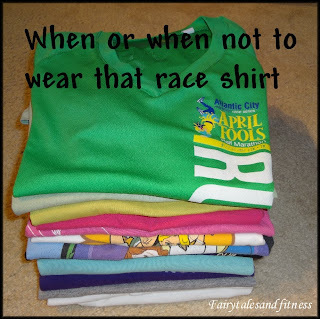 Moral of the story is ( in our humble opinion) it’s okay to wear the race shirt if you want to. We’ve done it! Now all in good fun, what’s your opinion on wearing or not wearing the race shirt on race day? Have you tried the new Gluten Free Vanilla Chex? We’ve just discovered them earlier this summer and are in love! 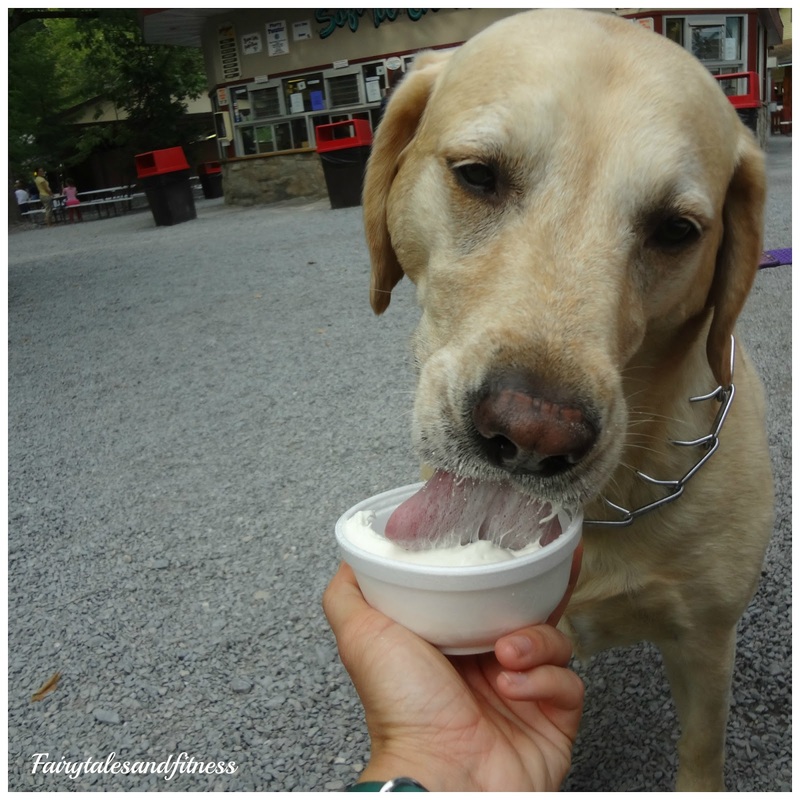 Neither of us are on a gluten free diet, but the vanilla flavor is what enticed us to try them. I normally don’t eat Chex cereal ( unless it’s in Chex mix or that yummy puppy chow treat we make during the holidays…who knows what I’m talking about?) but I’ve been buying this stuff two boxes at a time! 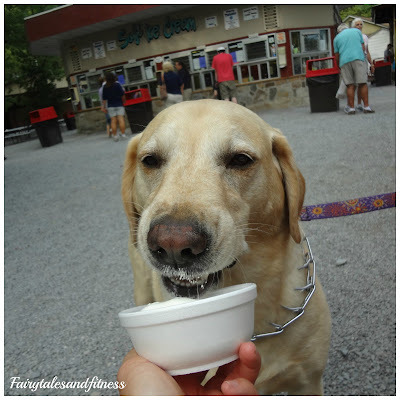 It’s been a staple for my summer breakfasts before a run, a bowl of vanilla Chex with some vanilla Almond milk…yum! This cereal has the most vanilla flavor of all the "vanilla flavored" cereals I have tried. Cereal is usually my go to snack. I’m not big in to pretzels, crackers, chips, etc. I put about a cup of cereal in a small Rubbermaid dish and I’ll just snack on it dry. Normally I have been known to eat the not so healthy cereal like Reese’s Peanut butter Puffs ( hey, at least they are whole grains). I have now replaced the peanut butter puffs with the sweet taste of Vanilla Chex. I can’t wait to use the Vanilla Chex in our Puppy chow recipe this year. I think there was even a recipe for that on the box I bought this week! What’s your favorite recipe for Chex cereal? Have you heard of “Puppy Chow”?